Donna Bella’s medical grade adhesive comes pre-cut to fit Donna Bella’s Tape-In hair wefts. 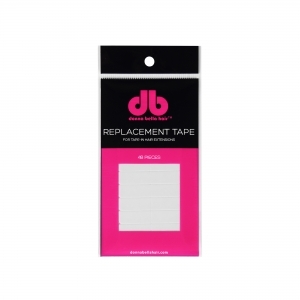 It's perfect for reattaching Tape-In hair extensions to clients' hair for prolonged use and the medical grade adhesive prevents allergic reactions and keeps the hair safe from chemicals. The adhesive is permanent and, if maintained correctly, will last until the extensions are ready to be removed. The tape is removed with Donna Bella’s special Tape-In Bond Remover. Our chemists have mixed this state-of-the-art formula to help break down the bond in a quick and efficient manner, as well as to gently remove the tape and adhesive from the client's hair.